The Curtiss-Wright VZ-7 was a VTOL aircraft designed by the Curtiss-Wright company for the US Army. Like the Chrysler VZ-6 and the VZ-8 Airgeep it was to be a "flying jeep" . Two prototypes were delivered to the US Army in mid-1958. The VZ-7 had a fuselage with the pilot's seat, fuel tanks and flight controls. On both sides of the fuselage the propellers were attached, unshrouded (the aircraft did originally have shrouds, but these were later removed). There were 4 propellers in total. The VZ-7 was controlled by changing the thrust of each propeller. 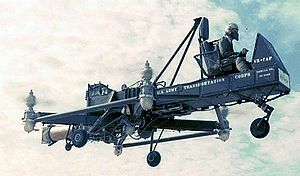 The flying platform was maneuvrable and easy to fly. The aircraft performed well during tests, but was not able to meet the Army's standards, therefore it was retired and returned to the manufacturer in 1960. One VZ-7 is part of the United States Army Aviation Museum aircraft collection at Fort Rucker. However, it's not on public display due to space restrictions.